As a good friend to Winnie the Pooh, Christopher Robin, and all the other residents of the Hundred Acre Wood, for that matter, Owl is ever willing to offer his opinions and advice. Solicited or not! He's a pretty good storyteller, too, particularly when the tales are about family members -- such as Uncle Robert, who survived a very blusterous day. 1. Generously frost one third of the top of each cupcake. 2. Next, create owl eyes. For each pair, slice a caramel Bullseye candy in half to create 2 thinner circles. Place the halves between two sheets of waxed paper and use the rolling pin to flatten them slightly (they should be about 1 1/2-inch-wide). 3. Top the caramels with white candy melts, and then set a chocolate chip on top of each candy melt, using dabs of frosting to hold the pieces in place. 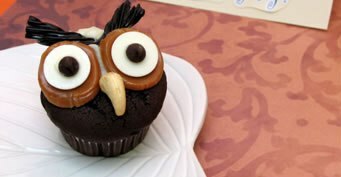 Place a pair of eyes on each cupcake, pressing them down onto the frosted portion. 4. Create facial feathers for each owl by snipping two 1 1/2-inch lengths from a piece of black licorice. Cut fringe in one end of each length. Then stick the fringed licorice pieces in place right above the eyes. 5. For the finishing touch, add cashews for the owls' beaks. "Winne the Pooh hits cinemas on April 15"